1. Karate-Robo Zaborgar, dir. Noboru Iguchi. Japanese genre mixologist Noboru Iguchi returns to AUFF with his latest concoction: An ode to ’70s Japanese robot martial arts TV shows, Karate-robo Zaborgar. The lead character is described as: Part motorcycle, part karate expert … all robot! 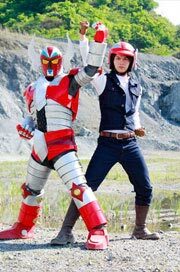 A police officer and his metallic partner battle the evil organization Sigma, which is responsible for the cop’s father’s death. 2. Some Guy Who Kills People, dir. Jack Perez. Executive produced by John Landis and starring Kevin Corrigan and Karen Black, Some Guy Who Kills People is the story of a pathetic loser who lives with his mother and young estranged daughter who brutally slaughters the people he feels have done him wrong in life. 3. Sennentuntschi: Curse of the Alps, dir. Michael Steiner. This thriller from Switzerland is based on an old Alpine legend in which three lonely herdsmen build the woman of their dreams out of a broom, some straw and old rags. Their simple life becomes complicated — and much more violent and spooky — when the Devil turns the handmade Sennentuntschi into a real, live girl. 4. White Knight, dir. Jesse Baget. White Knight stars Tom Sizemore as the notorious Grand Dragon of the Ku Klux Klan who gets sent to a prison work farm. While being “rehabilitated,” the intense racist starts having romantic longings for a pretty young Mexican girl who works in the warden’s office and the only way he can win her heart is through his translator: His Mexican cellmate. 5. Dragonslayer, dir. Tristan Patterson. Dragonslayer is a documentary that profiles Josh “Skreech” Sandoval, the skateboarding legend of Fullerton, California who criss-crosses the abandoned swimming pools of his hometown on his board. The film has screened recently at the Revelation Perth International Film Festival and will also screen at the next Sydney Underground Film Festival. 6. Marianne, dir. Filip Tegstedt. From out of Sweden comes this thriller about a recent widower whose nightmares about the death of his wife are slowly causing him to lose his grip on reality. Festival passes, limited to just 100, are now currently available on the festival’s website. The Underground Film Journal will have the full festival schedule up when it’s released next month.